A mezuzah mounted on the doorpost designates the home as Jewish, reminding us of our connection to G‑d and to our heritage. A mezuzah is not, contrary to popular belief, the outer container. The mezuzah is actually the parchment scroll within, on which the "Shema" -- a biblical passage declaring the oneness of G‑d -- is handwritten by an expert scribe. The mezuzah is also a symbol of G‑d's watchful care over the home. The name of G‑d, Sha-dai, which appears on the reverse side of the parchment, is an acronym for the Hebrew words which mean "Guardian of the doorways of Israel." The placing of a mezuzah on the doors of a home or office protects the inhabitants -- whether they are inside or outside. 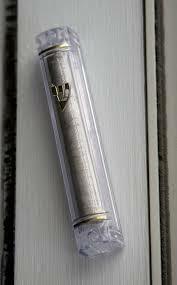 For £20 you receive a mezuzah for your room or house (case included). At the end of the year, you decide: keep it, or return it & get your money back. For more info, call Rabbi Eli on 07813-564-564 or email rabbi@muchabad.org.